This paper investigates the external factors of influence on Cuba’s efforts to develop nuclear energy. This discussion will center on the bilateral, multilateral and international aspects of Cuba’s cooperation and interaction in the nuclear and energy fields. This is presented in three sections. The first section on bilateral cooperation reviews Cuba’s relations with its primary development partner as well as its burgeoning relations with partners in Europe, Canada and Latin America. The section on multilateral and international cooperation focuses on Cuba’s membership, role and interaction with the myriad international organizations, nuclear and energy related associations, in which it has participated in the period since the inception of the nuclear program. The following section will investigate the impact of the United States opprobrium to Cuban efforts in the energy sector with a specific emphasis on U.S. law and policy initiatives directed at undermining Cuba’s nuclear ambition. The modernization literature suggests that the source of the modernizing ideal will have a significant impact on the success and appropriateness of modernization schemes in developing states. Moreover, these schemes whether internal or external in nature will also carry significant implications for the trajectory of development within these states. On one hand, modernization schemes that take into consideration states’ human, technological and scientific resource bases are more likely to be sustainable. This has been a major challenge to the proponents of modernization theory, where things solely western are construed to be modern and vice versa, without consideration for their appropriateness to the society to which they are being applied. On the other hand, development may be nearly impossible without the involvement of external forces, both positive and negative. From this paradox it becomes necessary to review and analyze the impact of these forces. This is an especially important component in the analysis of Cuba’s nuclear ambition. This paper seeks to specifically identify and explain the key external variables and influences that potentially impact and influence Cuban decision-making in the energy sector. It is with these ideas in mind that we detail these relationships for the way in which they have influenced Cuban nuclear energy development policy, both positively and negatively. These relationships have evolved significantly in the period since 1991 and they continue to change in ways unforeseen by even the most keen observers and analysts of Cuban foreign relations. The consideration of nuclear energy exploitation in Cuba would have been all but impossible for Cuba without the Soviet Union (or another similarly equipped and willing benefactor). The case history suggests that Cuba’s nuclear ambitions owe much credit to its relationship with the former Soviet Union. It is clear that in the initial stages of development, the nuclear program could be viewed as a “satellite” project of the overall program of nuclear energy expansion in the Soviet Union and Eastern Europe. During this period Cuba relied heavily on the Soviet Union for financing and assistance, the training of personnel, the provision of materials and equipment, and construction of facilities. An integral part of the relationship between the Soviet Union and Cuba was the designing and implementation of a program for nuclear infrastructural development. This would include the creation of myriad support bureaucracies and the training of the personnel to work within these organizations. From 1982, when construction at the Juraguá site began, until 1992 when the successor state, the Russian Federation stopped providing assistance for the project, the Soviet Union poured over $1 billion into the construction at the site alone. Because the figures are unavailable one can only conjecture as to how much assistance was provided to Cuba in the formation and operation of this bureaucracy.6 This assistance, in addition to the capital outlays, included the provision of construction and training personnel, and technical support in the design, construction and operation of the research centers, facilities and agencies within the nuclear energy sector. This is not to say that the Cubans were completely satisfied with the terms of this relationship. They were certainly grateful for the assistance but were not always in agreement with the accounting practices, the schedule of delivery for key equipment and components, the chronic lack of spare parts, and the poor quality of those materials when finally delivered. Cuba’s client status and its reliance on the Soviet Union made pursuit of the nuclear energy capability possible but it also provided it with obstacles. These obstacles included debates over safety practices in the construction process, questions on reactor design, and the delays in the construction of the Juraguá Unit-1. Nonetheless, by 1992, Cuba together with the Soviet Union and then the Russian Federation had between 75 and 80 percent of the base construction at Juraguá Unit-1 completed, in addition to the creation of a vibrant nuclear scientific-technological infrastructure. This was a significant accomplishment for a developing state such as Cuba and by the early 1990s was suggestive of a bright future in the nuclear energy sector. Cuban officials, in part because of Russian patronage, enjoyed an elevated status among developing states. This elevated status was by virtue of its participation in international nuclear organizations, the renown of its nuclear medicine sector and the treatment of the victims of the Chernobyl accident, and the creation of highly trained cadres of nuclear engineers, specialists and technicians. The collapse of the Soviet empire in 1991 significantly impacted the terms of the relationship between the now Russian Federation and the Republic of Cuba. It presented challenges of the kind that could relegate much of the Cuban economy to pre- Revolutionary levels. In a short time this did come to pass. At the closing session of the Cuban National Assembly in 1993, Fidel Castro stated, “we are facing a very, very great challenge. We have to be ready for greater difficulties than we can imagine.”7 This stark assessment was based on the fact that in 1993 oil imports and international trade had declined by over half their previous levels, resulting in a severe energy crisis. In April 1992, Russia and Cuba concluded an agreement to continue funding for the Juraguá plant. With the project more than three-fourths complete, Cuba only needed to install the instrumentation and control systems for the reactor. Russian nuclear officials had contracted Siemens AG of Germany to install the systems. Unfortunately, Russia’s own precarious economic situation precluded that they pay for these services in hard currency as demanded by Siemens. Cuba, left to negotiate the $21 million payment with the German firm, was unable to generate the hard currency to complete the deal. This began a cycle of announcements of the resumption of construction between Russia and Cuba and the search for a joint venture partner willing to underwrite the project. Since 1992, Cuba has concluded four major trade and economic agreements with Russia containing reference to the Juraguá project and the resumption of activities at the construction site with no positive changes actually having occurred. 9 Little has come of these announcements and it raises questions as to whether or not Russia maintains a legitimate interest in completing it Cuban venture. Russia’s Ministry of Atomic Energy (MINATOM) plans to export nuclear materials and technologies worth $3.5 to 4 billion by the year 2000. It currently has eight nuclear power units at different stages of construction in Iran, Slovakia, Ukraine, the Czech Republic and Cuba.10 In the post-Cold War period, MINATOM has emerged as one of Russia’s major currency earning exporters along with Gazprom and Rosvooruzheniye. With a work force of 2 million Russia’s MINATOM-run empire earned $4.25 billion in exports in 1995 and 1996 with the annual projected growth of $3.5 billion by the year 2010.11 Talks are underway for the construction of plants in India, Indonesia and China. With Russia’s announcement calling for the resumption of construction of the Cuban project in February 1998, the plans clearly illustrate the instrumental nature of its involvement in the Cuban project. Russia still needs to demonstrate to its potential suitors that it can successfully undertake and complete a nuclear reactor construction project far outside its borders. Moreover, this is one of the few instances where Russian work is being subjected to international scrutiny during the entire construction process. With the legacy of the Chernobyl accident and other nuclear incidents, the Cuban project has been vilified for poorly designed systems, safety practices, and the lack of adequate nuclear waste storage and disposal. Russians counter this claim with the “fact” that “foreigners are attracted by (sic) Russia’s plants because, although cheap, their safety standards are comparatively high.”12 The safe and successful completion of a reactor in Cuba would go far in assuaging the suspicions of critics of the Russian nuclear industry. It would also present potential buyers of Russian nuclear reactors with an example of its ability to deliver the goods. This is the most important factor in attracting new buyers for Russian nuclear technology. As both countries enter the 21st century they are attempting to re-kindle their trade relations and mutual cooperation. Together they have built an impressive nuclear program in Cuba that includes the cadres of highly trained personnel devoted to the peaceful exploitation of nuclear energy. Their failure to complete construction of the nuclear reactors at Juraguá points to the now feeble economic foundation of the over 20-year nuclear cooperation relationship. It appears that the willingness remains firmly intact, it is just now that the limited economic capability of both states prohibits any significant advancement on the project. This has forced the Russian-Cuban partnership to look outside to attract potential partners to engage in a joint venture to complete the Juraguá project. The next section will detail Cuba’s relations with other countries in the energy sector. It will include a discussion of the efforts to elicit support from “tercer socios” in the nuclear project, but also with its relative success in attracting partners and investors for the conventional energy generation sector. Initially, while both countries could “disregard” the economic elements of the decision to develop a nuclear energy capability in Cuba, it has become apparent that the Russian Federation could not afford to support Cuban ambitions in the post-Cold War period. Moreover, the terms of trade are now cast in strictly economic terms eschewing any notion of the now moribund “socialist brotherhood.” These factors indicate that Cuba’s nuclear program is now mostly likely conforms to the expectations of the economic and technological modernization model of energy development. The evidence supports the contention of this model that would promote the nuclear program as long as it corresponds to the promotion of economic self-sufficiency. Given the overwhelming changes since 1991, it is hardly surprising that Russia has curtailed its activities because it could hardly justify the Cuban drain on its resources. Nor could the Cubans in an even more precarious economic state justify the expense of such a grandiose project when its ability to meet the basic needs of its population has been seriously compromised. Until 1992, Cuba sought and received assistance for its nuclear program from the Soviet Union. The demise of the USSR and the COMECON18 states left Cuba, as well as those states in a severe economic crisis. Russia attempted to continue providing support for the Juraguá construction but its own economic travails at home left it with little recourse but to search out a partner to assist it in finishing construction at the Juraguá site. Russia had successfully constructed a nuclear reactor through a joint venture in Finland. In constructing the VVER-1000 model reactor at Loviisa, the Russians were responsible for a majority of civil construction at the site and contracted the installation of the instrumentation and control (I&C) systems to the German engineering firm Siemens- Kraftwerk Union (KWU). This partnership was successful and as a result the Loviisa plant has been among the most efficiently operating facilities in the world. This was not the first instance in which Cuba had engaged in nuclear cooperation efforts with countries other than the Soviet Union. Dating back to 1986, Cuba has actively engaged other countries on two fronts. Initially, it sought nuclear cooperation agreements with other governments. After the fall of the Soviet Union the rationale for seeking cooperation in this area became more instrumental: to find willing partners (international commercial nuclear enterprises) to invest in the Juraguá project. At this time all three states were not signatories to the regional nuclear-free zone accord, the Treaty of Tlatelolco. In addition, all three were perceived to have nuclear weapons development programs and were the subject of much scrutiny from the international nonproliferation community. Shortly thereafter both Argentina and Brazil began to investigate the development of bilateral nuclear confidence building measures. This began with exchanges and information sharing, ending with a comprehensive regional nuclear cooperation organization linking both Argentina and Brazil with the International Atomic Energy Agency (IAEA) and a new bilateral organization, the Agencia Brasiliero-Argentino de Contabilidad y Control (ABACC). This cooperation culminated with both countries signing the Treaty of Tlatelolco in the early 1990s. In the immediate aftermath of the fall of the Berlin Wall, Cuba began to investigate alternate means of completing the Juraguá project. By May 1991, at the behest of the Russian Federation, Siemens-KWU of Germany was nearing the end of negotiations to supply the I&C equipment for the Juraguá units. Cuba was also discussing the I&C upgrade with two other nuclear firms, Cegelec of France and Skoda Works of Czechoslovakia. The work was valued at about $40 million. Cegelec and Siemens held discussions with the Cuban and Russian officials about the extent of work needed to upgrade required to improve the safety of the reactors. This bid was similar to the contract that Siemens won to upgrade the I&C systems at Mochovce-1 and -2 in Czechoslovakia. After consultations with the United States Nuclear Regulatory Commission about the adequacy of I&C technology at the Cuban plants, Cuba approached Skoda. Skoda together with the Russians had supplied these systems for reactors throughout Eastern Europe. It told the Cubans that the work would cost around $300 million. It was then that Cuba sought more economical bids from Siemens and Cegelec. At that time the United States Departments of State encouraged countries with advanced nuclear sectors such as France and Germany to become involved in improving the safety of the Cuban reactors. The United States Departments of Defense and Energy, however, were wary of any steps, which would allow the reactors to go on-line.21 Even with this flurry of activity the inability of the Cubans to provide the required financing for continued construction on the reactors effectively relegated these potential deals to the trash heap. The efforts of Cuba to involve other states or multinational nuclear firms in the Juraguá project have been largely unsuccessful. A number of these firms have visited the Juraguá site and then opted not to participate in the venture. The reasons remain undisclosed and one can only conjecture to why there has been reluctance for involvement in this venture. Certainly, the economic difficulties that Cuba has experienced since the early 1990s have mitigated interest in the nuclear program. The potential for U.S. opprobrium to the Cuban venture has potentially lessened the desire of these firms to conclude any type of agreement with the Cubans but this remains only as speculation. The impact of the “temporary state of suspension” has significantly effected Cuba, and because of its continuing reliance on a deteriorating energy infrastructure the energy sector was near collapse. Many of the existing thermoelectric generating facilities were old and in immediate need of major repair or outright replacement. To address this chronic problem Fidel Castro announced in January 1997 that Cuba would seek alternative sources of energy to stave off the collapse of the energy sector and to maintain the economic growth trend of the mid 1990s. Remarkably, the response to this initiative was well received within and outside of Cuba. At the start of 1998, Cuba was negotiating or had concluded a number of deals to upgrade its existing thermoelectric facilities and to construct new facilities on the island. All of these projects were joint ventures between Cuban and foreign firms. Moreover, all of these projects were concluded with guaranteed sources of funding. Cuba by 1999 also plans to build a 250MW thermal unit in Holguín province to serve its vibrant nickelmining sector. It has not been revealed where the $250 million in needed for financing the projects will come from. The government is also planning an ambitious plan to increase overall generating capacity through a $500 million program to upgrade three 100MW units at the Santa Cruz del Norte generating complex and build an additional 350MW unit over the next three years. The Canadian firm First Key Project Technologies will carry out the work. The project will involve the creation of a joint venture between First Key, the Chilean firm Santa Ana, and the Cuban state power company Unión Eléctrica. The venture will sell the power for hard currency to mining interests and other companies doing business in Cuba. It is also expected to be the first project to date in Cuba to be run by an external enterprise. The leading candidates for the project are Spain’s Endesa and Electricite de France (EdF). Funding for this venture is expected to come from the Canadian Export Development Corporation and other lenders. All told, the rapid expansion of projects in the thermoelectric generation sector is remarkable given the static nature of investment and activity in the nuclear energy sector over the past six years. As of early 1998 plans are underway to upgrade the generating capacity of eight existing units with the potential of 800MW. The investment for these units totals $315 million completely underwritten by foreign firms. Meanwhile, Cuba has plans to expand this sector by 600MW generating capacity over the next three years; $350 million of the $600 million required for the projects has already been secured. The additional 600MW generating capacity will in increase Cuba’s total capacity by 16 percent. This will be bolstered by Cuba’s efforts to conserve and reduce domestic energy demand and increase the efficiency of existing facilities. The decision to deemphasize the nuclear program has opened the possibility of expanding the thermoelectric sector. Foreign firms have wasted little time in seeking out investments in this area and for the time being it appears that these projects will help Cuba to address it chronic energy problem. But the movement toward this type of energy generation raises other questions. Will Cuba’s oil imports increase as a result of this expansion? Will this consume an even larger portion of Cuba’s export earnings in the short-term period? And does this signal a return to the foreign dominated concerns to Cuba? The terms and conditions of these projects seek to reward the investor first and the Cubans last. Moreover, these projects are directed at supplying energy and services for firms doing business in Cuba. It appears outwardly, at least in the short-term, that the lot of the Cuban society will improve little as a result of these projects. Moreover, it appears that the focus of Cuba’s foreign relations in the energy sector has shifted from government-to-government nuclear cooperation and development agreements, to joint venture projects involving Cuban state firms and foreign energy concerns. This shift also reflects the movement away from a reliance on a single source of materials, assistance, equipment and financing for Cuban energy ventures. Unfortunately, for Cuba this has not included participation by these firms in the nuclear energy development program. As mentioned, numerous foreign firms have exhibited an interest in the Cuban project and have visited the facility at Juraguá. In each instance the prospective suitor has declined to invest or participate in the venture. This surely prompted the shift in policy by the Castro regime. A cursory examination of the change in policy orientation has been moderately successful and lessens the disappointment of maintaining the “temporary state of suspension” for Cuba’s nuclear ambitions. As with the previous section on Cuban relations with the Russian Federation, this section offers evidence supporting the economic and technological modernization model. All of the bilateral activities are consistent with this approach by seeking to expand Cuba’s technical and scientific capability, as well as corresponding to the expectation of promoting economic self-sufficiency. The bilateral energy initiatives selected have been oriented toward the modernization of the existing energy infrastructure or expansion of the energy sector’s generating capacity. Moreover, investment by external actors in Cuba’s energy sector is indicative of the economic viability of these projects. Unlike the previous analyses offered where the evidence presented supported the economic and technological modernization model as well as the economic and energy security model, Cuba’s efforts to increase its thermoelectric capability significantly deviates from the expectations of the economic and energy security model. Whereas the model focuses on the maintenance of access to secure sources of energy, the Cuban bilateral activities indicate a shift away from this priority. Cuba by increasing its thermoelectric capability also increases its dependence on external sources of fossil fuel. In addition this increases Cuba’s exposure to the vagaries of the world energy markets, of which the implications are the increased possibility of an imbalance between economic growth and security planning. From this point forward the economic and energy security modernization model loses much of its explanatory value because it can no longer account for the priorities or the trajectory of the Cuban energy sector. This section of the paper looks at the cooperative efforts by the Cubans with multilateral organizations in the field of nuclear energy development. This includes a discussion of Cuba’s relations and involvement with the International Atomic Energy Agency (IAEA), the United Nations Development Programme and the Organización por la Proscripción de Armas Nucleares en América Latina (OPANAL). In addition it will touch upon the other nuclear related international organizations of which Cuba is a member or participant. Moreover, this section will detail how these efforts have assisted Cuba in advancing its nuclear energy policy. Cuba has been a member of the IAEA since its inception in the 1960s. From that period through the present, Cuba has maintained a positive relationship with the multilateral organization. It has received assistance in the forms of training of personnel in specialized fields of nuclear science and technology, laboratory equipment, grants and fellowships for study and training abroad, and consultation on aspects of nuclear safety, materials handling, quality assurance and regulatory and licensing procedures. In addition, Cuban representatives have served the IAEA in a number of capacities, including safeguards inspection team members, resident technicians, international civil servants and as a member of the Agency’s Board of Governors. Cuba for its part has had an active role in the IAEA. In 1983, it was elected for the first time to the Board of Governors, this was repeated in 1987. Fidel Castro Díaz-Balart, the Executive Director of Cuba’s Atomic Energy Commission (CEAC), served as the Cuban representative to the Board. The relationship has been fruitful and beneficial for Cuba and until recently was viewed as a means of monitoring the development of the nuclear program and of proliferation risks. There is presently debate over the nature of assistance be provided from the IAEA to Cuba by the U.S. Congress, yet the positive relationship continues. Supporters of this relationship between the IAEA and Cuba contend that it serves the interests of all parties, directly and indirectly, involved. During the 1970s Cuba signed, at the insistence of the Soviet Union, three safeguards agreements with the IAEA, which currently apply to all nuclear facilities on the island, including the nuclear facilities, a nuclear research reactor, and a zero power reactor.30 The IAEA spent about $12 million on nuclear technical assistance projects for Cuba since 1963—when Cuba began receiving nuclear technical assistance from the international agency—though 1996. 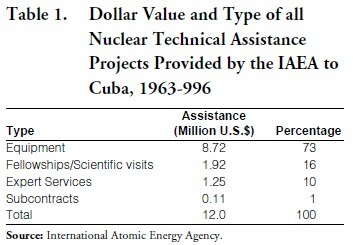 About three fourths of this assistance Cuba received through these projects consisted of equipment such as computer systems, and radiation monitoring and laboratory equipment (See Table 1). The IAEA’s nuclear technical assistance was given primarily in the areas of general atomic energy development and in the application of isotopes and radiation in agriculture. In 1997, the IAEA approved an additional $1.7 million for nuclear technical assistance for projects in Cuba for 1997 through 1999.31 In addition the IAEA spent about $2.8 million on training for Cubans and research contracts for Cuba that were not part of the specific nuclear technical assistance projects.32 Of the total dollar value of all nuclear technical assistance that the IAEA has provided to Cuba, about $680,000 was approved for nuclear safety assistance for the nuclear reactors under construction at Juraguá for 1991 through 1998, of which about $313,000 has been spent. The IAEA is assisting Cuba in developing the ability to conduct a safety assessment of the nuclear power reactors, and in preserving, or “mothballing” the reactors while construction remains suspended. The IAEA is also implementing a training program for personnel involved in the operational safety and maintenance of all nuclear installations in Cuba, including the reactors. 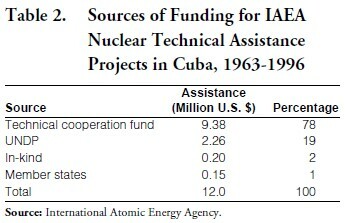 33 The Agency’s technical cooperation fund has been the primary source of funding for the nuclear assistance projects provided for Cuba (see Table 2). • Since 1995, the IAEA has assisted Cuba in designing and implementing a training program for personnel involved in the operational safety and maintenance of nuclear facilities and installations. The IAEA has spent $31,000 of the $74,000 allotted for these activities. Cuba’s thirty five-year history of participation and cooperation with the IAEA has been impressive. As a developing country, Cuba has served as a leader in the advancement of nuclear science and technology, and has played a significant role in the administration and leadership of the IAEA. It has relied heavily on the agency for financial and technical support in areas of nuclear science. In December 1995, Cuba formally signed the Latin American nuclear weapon-free-zone accord, the Treaty of Tlatelolco, in Mexico City. Cuba was the last country in Latin America to sign the Tlatelolco accord.39 A preliminary assessment of the proliferation risks emanating from Cuba suggests that the Cuban government, by virtue of its “positive” movement in nonproliferation matters, has embarked on a course favorable to the international community that would be difficult if not impossible to reverse. Cuba, upon ratification of this regional accord by its National Assembly, agrees not to introduce nuclear weapons of any kind into the region. It also agrees that the IAEA, with which it already has favorable relations, will be allowed to inspect all Cuban nuclear facilities. Upon ratification Cuba must submit a full inventory of all nuclear materials and technologies to the accord’s organizing body, the Organización por la Proscripción de Armas Nucleares en América Latina (OPANAL), and also conclude full-scope safeguards agreements for all these materials with the IAEA. Given the growing cooperation in nuclear affairs and sense of unity in Latin American relations, the Castro government has astutely engaged its Latin American partners in regional and bilateral security and nuclear cooperation arrangements to garner much needed closer economic ties. The signing of the Tlatelolco accord attests to this aspect of Cuba’s burgeoning cooperative resolve. The present regime has placed its credibility in the post-Cold War period on being a “good neighbor,” one that is willing to engage in international cooperative efforts. This activity may also serve an instrumental function. It is possible that Cuba is using this movement to attract a potential investor for its moribund nuclear reactors at Juraguá. Be that as it may, Cuba has taken a significant step away from its Cold War posture in relation to such nuclear nonproliferation and security arrangements. Throughout the Cold War period it maintained that the nuclear nonproliferation regime discriminated against those states that did not possess nuclear weapons and favored those that did. Cuba also maintained that it was no going to sign any such accord until all other states in the region did so as well. With the accession of both Argentina and Brazil into the Tlatelolco regime in the early 1990s, Cuba remained the only hold out. Cuba’s intransigence in this area was also inconsistent with its participation in other similar non-nuclear arrangements. As of the time of writing, Cuba has not ratified the Tlatelolco accord, and it remains a non-voting observer in the proceedings of OPANAL. Cuba also has not signed, nor has it expressed in interest in signing, the Nuclear Nonproliferation Treaty. Cuba has not limited its international cooperation to the IAEA alone. Cuba received financing and support from the United Nations Development Program (UNDP) in the initial development stages of the nuclear program. In the period from 1980 until 1988, Cuba received approximately $1.66 million in assistance from the UNDP. Most of this aid was in the form of equipment for research laboratories and facilities employing nuclear applications. The total figure of UNDP assistance to the Cuban nuclear program from 1963 through 1997 is $2.26 million. Almost all of these funds have been channeled to Cuba in the form of grants to the IAEA. Seeking to expand its cooperation in the nuclear sphere with other countries in the region, Cuba in 1988 began to cooperate in the Arreglos Regionales Cooperativos para la Promoción de la Ciencia y Tecnología Nucleares (ARCAL). Cuba is involved in a majority of the projects which the group undertakes. Involvement in these organizations further enhances Cuba’s ties within the epistemic communities they serve. But it is difficult to assess the benefits that would accrue directly to the nuclear program through these organizations. With the exception of UNDP assistance, Cuba is not likely to receive assistance significant enough to assist it in advancing the nuclear program. As the focus of these organizations is the promotion and dissemination of information and research to their constituent members, these activities can be viewed as contributing positively to the scientific development in Cuba and elsewhere. Cuba’s cooperation with multilateral organizations has ostensibly served two purposes. First, they have garnered Cuba with a modicum of international political support in its effort to develop a nuclear energy capability. Second, and more importantly, they have provided Cuban nuclear officials with a means of advancing their scientific and technical base through involvement with specialized multilateral organizations, and in particular, the IAEA. This evidence coincides with the expectations of the economic and technological modernization model. Moreover, Cuba’s specific efforts to expand the scientific an technological base through IAEA-sponsored training programs in such critical areas as licensing and regulatory procedures, nuclear safety controls and quality assurance can be viewed as a part of its program to expand its knowledge in technical matters. This factor, coupled with the overarching objective of modernization through advanced technological capability, clearly supports the expected behavior of actors pursuing modernization under the economic and technological model. Prominently displayed in the Helms-Burton legislation are provisions that set out to limit Cuba’s ability to complete its nuclear policy objectives of completing construction of the nuclear reactors at Juraguá. Specifically, these provisions aim to reduce the desire of Cuba’s would-be nuclear trading partners, most notably the Russian Federation, from engaging the Cubans in any meaningful way. The Helms-Burton Act calls for the “withholding from assistance allocated for any country an amount equal to the sum of assistance or credits … in support of the completion of the Cuban nuclear facility at Juraguá” (Title 1, Sec.111). One could argue that the mostly symbolic nature of Cuban-Russian nuclear cooperation in the post-Cold War period is indicative of the success of this approach. A much more reasonable appraisal would point to the chronic shortages of hard currency for both partners that have brought this project to a standstill. Yet, these provisions aim to limit the possibilities of this cooperation with the threat of a reduction in foreign aid to Russia. Ironically, this law contains exemptions for the most significant area of assistance effecting Russia’s nuclear industry, that pertaining to the stabilization of its nuclear arsenal. Under the 1993 Comprehensive Threat Reduction Act or “Nunn-Lugar Act” (Public Law 103-160), Russia’s nuclear infrastructure has been earmarked to receive assistance to stabilize its nuclear assets. Moreover, assistance to Russia and other states of the former Soviet Union are exempted from these sanctions in the areas of political, economic and humanitarian aid. This has the effect of allowing Russia’s MINATOM a free hand to continue cooperating with Cuba and pursue reactor sales in the international nuclear markets. Furthermore, under the provisions of international nuclear accords and as a member of the IAEA, Cuba is entitled to pursue a nuclear energy capability so long as it adheres to provisions of full safeguards and nuclear safety protocols. In February 1997, NBC Nightly News reported that funds contributed by the United States to the IAEA were being used to fund training programs for Cuba’s nuclear program. A subsequent GAO study of the issue indicated that indeed that a portion of the voluntary contribution by the United States was earmarked for technical assistance programs for the Cubans. 41 But a closer inspection of the figures indicates that there is more smoke than substance in the story. In 1996, the United States contributed $16 million (about 30 percent) to the IAEA’s technical cooperation fund. Cuba for its part contributed $45,150 (or 0.7 percent). The IAEA has approved $1.7 million in technical assistance for projects for Cuba for 1997 through 1999. By extrapolation, the United States contribution to the fund over this same period of time would be around $48 million of the $159 million total. The amount of technical assistance for Cuba—$1.7 million—is 3.5 percent of the total U.S. contribution. That assistance from the IAEA coffers to Cuba represents 1.06 percent of the total contributions to the fund for 1997 through 1999. The reduction of the 3.5 percent that goes to Cuba from the U.S. contribution to the fund would only amount to a paltry $59,500. This would not disable Cuban cooperation with the IAEA, nor could it be conceived as an impediment to the provision of assistance to Cuba from the agency. Symbolically, opponents of the Cuban program could point to the noninvolvement of the US for assistance programs from the IAEA. Whether it is $59,500 or $1.7 million matters little. The IAEA will most likely push forward with the assistance and training programs that ultimately benefit the United States as well as Cuba. Yet in July 1997 a bill was introduced in the House of Representatives by Congressman Robert Menéndez to withhold U.S. assistance for programs and projects of the IAEA in Cuba. H.R. 2092, known as the IAEA Accountability and Safety Act of 1997, is clearly designed to wash American hands clean of any involvement in Cuba’s nuclear program. A similarly worded amendment was included in the 1997 Foreign Relations Authorization Act for 1998 and 1999. But short of painting a self-congratulatory and triumphalist picture of uncompromising opposition to the Castro regime these bills are essentially toothless and clawless tigers and would violate the spirit of international nonproliferation cooperation. Like the Helms-Burton law these proposed pieces of legislation, render themselves moot by the nature of the exceptions to their provisions. Sec. 2 (2)(B)(I) states that the law would not apply to IAEA programs for “safety inspection of nuclear facilities or related materials, or for inspections and similar activities designed to prevent the development of nuclear weapons” by Cuba. This sounds very much like the mission of the international organization under which all these activities would take place. The restrictions specific to the Juraguá facility and the nuclear research center at Pedro Pi would be lifted by the United States if Cuba: (1) ratifies the Treaty of Tlatelolco or the Nuclear Nonproliferation Treaty; (2) negotiates full-scope safeguards with the IAEA not later than two years after ratification of the accord; and (3) incorporates internationally accepted nuclear safety standard into practice. Interestingly enough the latter has been the focus of Cuba’s nuclear activities for well over the past year. In 1996, the Cubans embarked on a new nuclear law project to complement the passage of “Decreto-Ley No. 208—Regarding the National System of Accounting and Control of Nuclear Materials.” Cuban nuclear officials have indicated that the reason for delay in the ratification stems from the need to alter the existing legal basis of nuclear law so that it will more easily comply with the provisions of agreements with which they fully intend to comply. Decreto-Ley No. 208 represents part of that effort. Cuban nuclear officials are clearly cognizant of the shortcomings of the Soviet-based systems of accounting, control and materials handling. They have sought to design legislation that conforms to internationally recognized standards and norms of nuclear materials handling and storage. They have modeled the system in spirit on the scope and objectives contained in U.S. Nuclear Regulatory Commission standards. Reaching that standard is another question altogether. But they have sought to make this system amenable to the requirements of the full-scope safeguards agreements that Cuba intends to sign when the treaty comes into force. On a larger scale, the new nuclear law project, under the direction of the Agencia de Energía Nuclear and the Centro Nacional de Seguridad Nuclear, seeks to place all of Cuba’s nuclear activities under a system of laws and practices that correspond to existing and future international nuclear standards.43 Should this come to pass, and by all indications it appears that it will, there will be very little that the United States can do to impede the progress of the Cuban nuclear project. This paper sought to detail Cuba’s external nuclear cooperative efforts, and the impact of these efforts on the Cuban nuclear energy development policy. The impact has been overwhelmingly favorable during the Cold War period and in the face of Cuba’s economic troubles during the period since the end of the Cold War. The first section focused on Cuba’s bilateral relations with the Russian Federation, and then with Cuba’s Western European and Latin American partners. The second section was a review of Cuba’s participation and cooperative projects in multilateral, international and regional nuclear-related organizations. This section focused on nuclear assistance agreements established by Cuba and the IAEA. The section also touched on the participation by Cuba in other regional nonproliferation and nuclear cooperation regimes. The last section dealt with the United States’ policy to close down or limit nuclear assistance to Cuba from states in the international system. The purpose of this analysis centers on the impact and influence of these international interactions of the choice, implementation and successful accomplishment of Cuban nuclear policy objectives. The modernization literature has suggested that the impact of these influences is highly determinate of the appropriateness and success of modernization schemes in developing states. Moreover these influences will carry significant implications for the trajectory of development within these states. In relation to these influences, developing states find themselves in a paradoxical situation. For development to be sustainable, the development scheme must take into consideration that country’s resource base. Unfortunately, states often disregard the appropriateness of an advanced technology such as nuclear energy for a developing state. But development may be nearly impossible without the involvement and assistance from external sources and their imperatives. Foreign policy and development analysts have tried to forecast what Cuba’s external trade policies would look like in the aftermath of the Soviet demise. How would Cuba respond to the new nature of relations with the former Soviet Union? What role would the Western Europeans and Latin Americans play in Cuba’s attempt to keep the nuclear program alive? And, would the IAEA continue to be willing to simultaneously promote and assist Cuba in the peaceful exploitation of nuclear energy, especially now with intense pressure being applied by the United States to terminate these activities? The following discussion addresses those questions and other issues germane to the Cuban attempts to keep its nuclear aspirations afloat. The loss of Cuba’s primary nuclear trade partner has devastated the nuclear program. While the Russian Federation has attempted to keep the Juraguá project alive, the fact remains that the numerous trade agreements concluded between Cuba and Russia to complete construction have been mostly symbolic in nature. The search for the third partner in the joint venture to complete the reactors has been fruitless. The Soviet Union made Cuba’s nuclear ambition a reality. The Soviet-successor state has had neither the desire or wherewithal to support such a venture so far from home. The suspect investment prospects for the project have limited Russian and Cuban efforts to maintaining a mothballed program until the time when the interest and financing for completing the reactors become tangible. Some critics in Russia now blame the short-sighted leaders of the newly democratic state for losing the Cuba that everyone else in the world is now finding. But to limit the discussion to the failures of post-Cold War policy between Russia and Cuba would minimize the significant advances made in the creation and development of a wellconceived and vibrant nuclear infrastructure. While it is true that Cuba’s nuclear reactors is moribund, there now exists a resource base that enables Cuba to easily tackle the nuclear option when the circumstances warrant it. Russia must still demonstrate to its potential nuclear clients throughout the world that it can successfully complete a nuclear reactor outside of its borders and under international scrutiny. For this reason, there is little reason to suggest that either Cuba or Russia will terminate their nuclear cooperation relationship anytime soon. While a number of other countries have expressed an interest in the Cuban nuclear program, not one has concluded an agreement to work on the program. In the early 1990s representatives from Germany, Spain, Brazil, Italy, and Argentina visited the Juraguá site and walked away. This inability to attract a project partner has been disheartening to the Cubans. Yet the nature of relationships between Cuba and other countries in the energy sector have evolved appreciably since 1991. The change has been especially significant since Fidel Castro announced in 1997 that the nuclear program would no longer be the sole focus of Cuba’s energy development program. In fact, it has opened the door to a flurry of joint venture activity to upgrade and construct new thermoelectric facilities throughout the island. The promotion of a national energy efficiency program has accompanied these overtures and promise to more than compensate for the inability to complete the Juraguá project. One issue is raised by the nature of these activities. Cuba has concluded these deals with guaranteed financing from external sources. In one case, the foreign firm will receive all proceeds from the operation of this new facility until such time as it receives it capital investment in full. Moreover, the joint venture with the Cuban state will be seeking to sell electricity to foreign firms for hard currency payments. The arrangement potentially could dampen the investment environment in Cuba, and it eerily resembles the economic arrangements of the pre-Revolutionary period. While states other than the Russian Federation have not stepped up to assume the mantle of primary nuclear trading partners, their activities in the non-nuclear energy generation sector has revitalized Cuban energy policy. Cuba’s nuclear infrastructure has prospered because of its participation in international and multilateral organizations. The interaction between Cuba and the IAEA has been an essential component in the development of the Cuba’s nuclear infrastructure. Since 1963, Cuba has received technical assistance from the IAEA to develop nuclear technical capabilities in a number of sectors across the Cuban economy. While Cuba has not received any direct funding from the agency in the construction of the nuclear reactors at Juraguá, IAEA assistance has helped Cuba to expand its nuclear program capabilities in the areas of quality assurance, nuclear safety, materials handling, command and control. The assistance has also provided the Cuban nuclear infrastructure with a model for the creation and development of the requisite agencies to carry out these tasks. Cuba has also benefited from its participation in the administration of the agency’s activities by serving on the IAEA Board of Governors, as well as placing Cubans on the nuclear safeguards inspection teams. In other instances, states’ have used the placement of their nationals on these inspection teams to later circumvent IAEA safeguards from revealing elements of nuclear weapons development programs. Cuba’s active participation and mostly transparent activities suggest that the trajectory of its nuclear program is entirely peaceful in nature. Cuba has concluded safeguards agreements with the IAEA, and by all indications it appears that it will continue to follow through with its commitments to these agreements for the foreseeable future. Cuba has recently signed the Treaty of Tlatelolco, and upon ratification it will more fully integrate its nuclear related activities to international accountability and scrutiny. This dispels any suggestion of a nefarious rationale to Cuba’s nuclear ambition. Cuba’s participation in the myriad international organizations devoted to the advancement of nuclear applications bolsters its own technical capacity, but also enhances it ties outside of the island. All told the cooperative activities undertaken by Cuba have greatly increased its nuclear capabilities, as well as, positively influencing the direction of nuclear energy development. Rather than constructing impassable obstacles to its nuclear ascendancy Cuba has astutely utilized its participation to support and advance its nuclear program. The United States opposition to the Cuban nuclear program has had little effect on its prosperity or privations. A majority of the legislative and policy positions taken by the United States has done little other than mollify criticism from the Cuban-American and anti-Castroites who regularly decry the looming Cuban Chernobyl. Moreover, the attempts to halt assistance to the Cuban program from the IAEA and other sources has verged on meddling in matters that are in reality of little concern, and are certainly not national security interests. The best that can be said about the United States position on the issue is that it serves no one’s interest to lambaste the Cuban nuclear program from afar when the means of assessing such a threat exists. The United States can and has cooperated with the Cubans on the nuclear issue. When scientific and technical analysis replaces the casting of aspersions across the Straits of Florida, then the United States may be able to construct a policy regarding Cuba’s nuclear program that conforms to reality and not to myth. The impact of the U.S. opposition limits legitimate and desirable contact between the American and Cuban scientific communities. Moreover, it places U.S. commercial interests at a disadvantage in investing in the Cuban energy sector while the rest of the world is engaging in successful joint ventures with Cuban state enterprises in Cuba’s energy sector. The survival of Cuba’s nuclear aspiration remains assured for the short-term. The influence of external forces in the nuclear program has been overwhelmingly positive. Cuba has advanced its nuclear potential in all areas because of the interaction with foreign states, international organizations and multinational firms. Cuba’s nuclear program has floundered primarily because of one reason, the lack of financing. For the Cubans and Russians the loss of the financial wherewithal to construct the reactors was as the ending of the Cold War, completely unforeseen. Frankly, no one could have predicted that the Soviets or the Russians would not have completed the venture in Cuba. Yet, as this came to pass, Cuba has found it difficult if not impossible to continue its pursuit of nuclear power. The failure to attract project partners stems from both Russia’s and Cuba’s inefficient scheme to build the reactors. No prudent investor would entertain participating in the nuclear construction venture as long as there is no tangible means to recoup the investment. The attraction of investment in the thermoelectric sector reflects a fundamental shift in the creation of joint ventures that favors the foreign enterprise. This examination demonstrated that Cuba was cognizant of its domestic energy resource constraints and logically sought and secured external assistance to advance its energy policy. It has been successful in the creation and development of a vibrant nuclear energy sector, short of completing the construction on the nuclear reactors. This is a remarkable accomplishment for any developing state, but especially for one such as Cuba, that has promoted the creation of knowledge and expertise matched by few countries in the developing world. 1. Among the most audacious of these tomes is Andres Oppenheimer, Castro’s Final Hour: The Secret Story behind the Coming Downfall of Communist Cuba (New York: Simon and Schuster, 1992). 2. See Andrei V. Kortunov, “The Role of External Factors in the Cuban Transition,” in The Military and Transition in Cuba: A Reference Guide for Policy and Crisis Management, Néstor Sánchez, editor (Leesburg, VA: International Research 2000, March 17, 1995), p. III-13-2. 3. Vladimir A. Borodaev, “Economic and Political Relations: Issues and Trends in the 1990s,” in The Military and Transition in Cuba, p. III-10-4. 4. Kortunov, “The Role of External Factors in the Cuban Transition,” p. III- 13-2. 6. In 1998, this includes 9 major agencies under the Agencia de Energía Nuclear (AEN) within the Ministerio de Ciencia, Tecnología y Medio Ambiente (CITMA). For details of the bureaucratic structure and functions see, Darío Gandarias Cruz and Daniel Codorniú Pujals, “El Programa Nuclear Cubano y Su Infraestructura Científico-Técnica,” a paper prepared for the Regional Seminar on Public Information, Havana, Cuba (May 19, 1995). 7. Quoted in José de Córdoba, “Survival Tactics: Its Economy Dying, Cuba Seeks Salvation in Dollars,” The Wall Street Journal (July 19, 1993), p. A1. 8. Wilson Dizard III, “Christopher Says Moscow to Pay Juragua’s $30-million Mothball Tab,” Nucleonics Week (September 30, 1993), p. 7. 9. This includes the concluding of these types of agreements in July 1993, October 1995, June 1997 and most recently February 1998. See Sergei Batchikov, “The Cuba that We are Losing Everyone Else is Finding: Russian Departments Are Hampering Trade with that Country,” Current Digest of the Post-Soviet Press (December 17, 1997), p. 21; see also “Cuba, Russia promise to reach deal soon on USfeared nuclear plant,” Agence France-Presse,(February 21, 1998) via Clari.Net. 10. There is also a mothballed reactor in Slovenia. It is uncertain given the hostilities in the region if the project will ever by resurrected. See Alexei Zayko, “Cabinet Gives the Green Light to Nuclear Power Engineering Development Program,” Russkiy Telegraf, No. 65 (December 19, 1997), p. 4. 12. Vladimir Teslenko, “Russia’s Nuclear Power Reactors for Sale,” Moscow News (December 25, 1997), p. 52. 13. Sergey Rybak, “Russians to Resume Juragua Construction Alone, Minatom Says.” Nucleonics Week, Vol. 38, No. 7 (1997), p. 2. 14. Batchikov, “The Cuba that We Are Losing,” p. 21. 17. Interview by author with Russian Ministry of Atomic Energy officials, Athens, Georgia, October 6, 1997 and November 15, 1997. 18. This is the acronym of the Council for Mutual Economic Assistance, the organization that managed trade among the socialist countries. Prior to 1991, over 80 percent of Cuba’s export and import trade was with this group of states. 19. Richard Kessler, “Argentina and Cuba Signed A Nuclear Cooperation Agreement,” Nucleonics Week (November 13, 1986), pp. 12-13. 20. Richard Kessler, “Argentina Confirms It Plans Deeper Nuclear Ties With Cuba,” Nucleonics Week (February 11, 1988), pp. 3-4. 21. Mark Hibbs, “Siemens Looking For Contracts to Upgrade I&C for Cuban PWR’s,” Nucleonics Week (May 16, 1991), pp. 1, 10- 11. 22. See “Cuban N-Plant: Completion Study Ready Soon,” NucNet News (August 9, 1995); Mark Hibbs, “Havana Says Juragua Feasibility Study Will Be Ready by August,” Nucleonics Week (June 29, 1995), pp. 3-4; “Minister Enlists Russia’s Help To Complete Nuclear Power Plant,” Radio Rebelde (Havana), May 6, 1995 in Latin American Developments, FBIS-LAT-95-090 (May 6, 1995). 23. Interview by author with Miguel Serradet Acosta, Director of Nuclear Energy Facilities, Ministry of Basic Industry, Havana, Cuba, January 26, 1996. 24. The author was a part of a delegation from the Center for Defense Information investigating the Cuban nuclear program. The delegation visited the Juraguá nuclear plant construction site October 25-31, 1997. 25. “Foreign Capital to Fund Expansion of Cuban Capacity,” Latin American Power Watch, Vol. 4, No. 4 (February 1, 1998). 27. “Cuba: Construction Plans for Proposed $150,000,000 Build-Operate (BO) Power Plant Project, Sherritt Power Corp., Canada – Order # 0331198,” Export Sales Prospector: ESP–Business Opportunities in Latin America & the Caribbean, Vol. 7, No. 3 (March 1, 1998). 28. “Project Planned to Increase Power Generation in Matanzas,” Radio Rebelde, Havana, in Spanish, January 27, 1998; British Broadcasting Corporation, February 3, 1998. 29. Economist Intelligence Unit, EIU Country Report: Cuba, Dominican Republic, Haiti, Puerto Rico, 2nd Quarter (1998), pp. 6-10. 30. The three INFCIRC.66 model agreements are: INFCIRC.281 (signed May 5, 1980); INFCIRC.298 (signed September 25, 1980); and INFCIRC.311 (signed October 7, 1983). INFCIRC/66 model agreements relate to “item-only” safeguards, particular technologies or materials. Any new projects that Cuba might consider in the future will have to be based on the INFCIRC/153 model. These agreements cover “full-scope” safeguards, all nuclear material in the peaceful activities of a nation. As Cuba has signed but not yet ratified the Treaty of Tlatelolco, it will have to re-negotiate full-scope safeguards agreements for all of its existing facilities and technologies. 31. See United States General Accounting Office, Nuclear Safety: International Atomic Energy Agency’s Nuclear Technical Assistance for Cuba, GAO/RCED-97-72 (March 1997), p. 2. 32. These projects include the contracting of translation services of official IAEA documents and technical reports into Spanish by Cuban nuclear agencies. Interview by author with senior Cuban nuclear official, Havana, Cuba, May 25, 1997. 33. This training consisted of courses in radiation protection and nuclear safety, probabilistic safety assessment, safety analysis and assessment techniques for operational safety of nuclear power plants, and quality assurance for nuclear plants. In addition, from 1989 through 1996, the IAEA spent $433,000 on research contracts for Cuba. Under the IAEA’s research program, the agency places contracts and cost-free agreements with research centers, laboratories, universities, and other institutions in member states to conduct research projects supporting its scientific programs. See United States General Accounting Office, Nuclear Safety: International Atomic Energy Agency’s Nuclear Technical Assistance for Cuba, pp. 3, 5. 35. This is consistent with Cuban legislative measures to bolster the legal basis of nuclear activities in Cuba. See Jonathan Benjamin-Alvarado, “The New Cuban Nuclear Law Project: Commentary on Cuba’s Decreto No. 208,” The Monitor: Arms Control, Nonproliferation and Demilitarization Vol. 3, No. 3 (Summer 1997), pp. 40-45. 36. United States General Accounting Office, Nuclear Safety: International Atomic Energy Agency’s Nuclear Technical Assistance for Cuba, p. 9. 37. The author attended these two joint meetings in Havana. The “International Symposium on Nuclear and Related Techniques in Agriculture, Industry, Health and Environment (NURT-97),” focused on the wide spectrum of nuclear techniques being applied in the region. They included those related to pest control; crop production; plant breeding; water resources; non-destructive testing in industry; radiation processing techniques; nuclear medicine; radiotherapy, radiopharmaceuticals; and nuclear analytical techniques in environmental studies. The “Workshop on Nuclear Physics (WONP-97)” covered topics on fast neutron physics and activation analysis; software on nuclear applications; development and design of nuclear instrumentation for spectroscopy and experimental physics; and advanced semiconductor detectors and related electronic research and developments. These meetings were attended by over 400 scientists and technicians from thirty countries. 38. Speech by Daniel Codorniu Pujals, President, Agencia de Energía Nuclear, before the 38th Session of the General Conference of the International Atomic Energy Agency, Vienna, Austria, September 22, 1995. Translated by the author. 39. Six months after the Cuban Missile Crisis of October 1962, the Presidents of Bolivia, Chile, Ecuador and Mexico, all deeply affected by the crisis, announced their intention to develop a multilateral accord with the objective of prohibiting the production. importation, storage and testing of nuclear weapons in their territories. After two years of intensive efforts, on February 14, 1967 the Treaty for the Prohibition of Nuclear Arms in Latin America was signed at the Mexican Ministry of Foreign Relations in the Tlatelolco district of Mexico City. The treaty entered into force on April 22, 1968. For a detailed history of the Treaty, see Monica Serrano, Common Security in Latin America: The 1967 Treaty of Tlatelolco (London: Institute of Latin American Studies, 1992). 40. Interview by author with Antonio Bolufe Gutiérrez, Director, Consultoría Delfos, Havana, Cuba, January 9, 1996. 41. See United States General Accounting Office, International Atomic Energy Agency’s Nuclear Technical Assistance for Cuba, GAO/ RCED-97-72 (March 1997). 42. See “Text of a Circular Letter of June 16, 1997 from the Permanent Mission of the Republic of Cuba to the International Atomic Energy Agency,” Attachment, INFCIRC/537 (July 30, 1997). 43. Jonathan Benjamin-Alvarado, “The Cuban New Nuclear Law Project,” The Monitor: Nonproliferation, Demilitarization, and Arms Control, Vol. 3, No.3 (Summer 1997), p.41.